The intestinal mucosal-arterial PCO2 (ΔPCO2) remains remarkably stable in anemic hypoxia suggesting that the villi perfusion is well-maintained1. The microcirculation, however, has been insufficiently studied in extreme hemodilution. To assess intestinal microcirculation during progressive hemorrhage and hemodilution. Sheep were assigned to either stepwise bleeding (n = 8) or blood exchange with HES 130/0.4 (n = 8). A sham group (n = 8) was also studied. Oxygen transport and consumption were measured by expired gases analysis, microcirculation with SDF-technology, and ΔPCO2 by air capnometry. In the last step, there were similar reductions in systemic and intestinal oxygen transports and consumptions, and increases in respiratory quotient and lactate, in ischemic and anemic hypoxia compared to sham group. 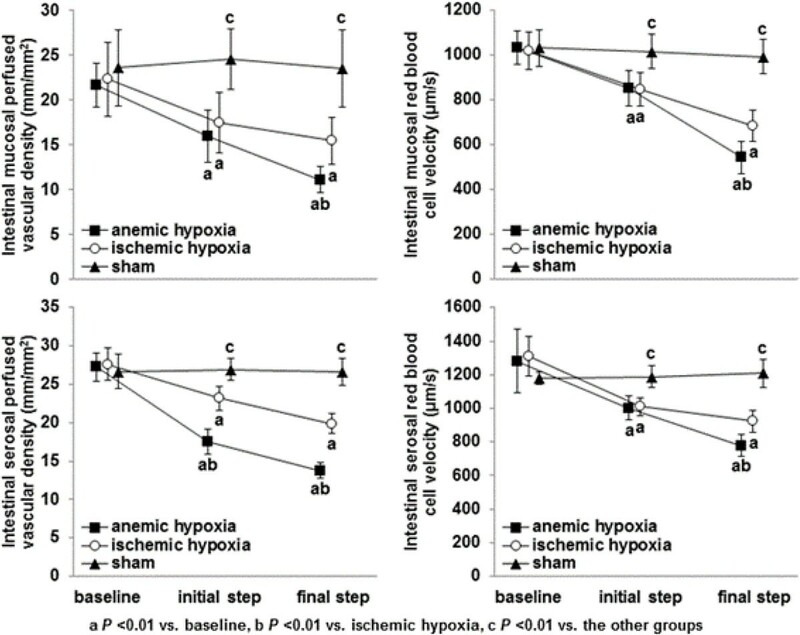 ΔPCO2 only increased in ischemic hypoxia (25 ± 10, 5 ± 6, and 5 ± 6 mm Hg, P < 0.01). Superior mesenteric artery blood flow decreased in ischemic hypoxia and increased in anemic hypoxia (138 ± 55, 524 ± 99, and 325 ± 112 mL/min, P < 0.0001), but mucosal and serosal microcirculations were more severely altered in anemic than in ischemic hypoxia. Although intestinal serosal and mucosal microcirculations were severely compromised in anemic hypoxia, the ΔPCO2 did not increase. The lack of change in ΔPCO2 cannot be ascribed to the preservation of villi perfusion. These findings might be explained by blood flow redistribution toward submucosal and muscular layers. Supported by the grant PICT-2010-00495, Agencia Nacional de Promoción Científica y Tecnológica, Argentina.